NY Times Review: Is Law School Really A Buyers’ Market? Application season is well under way, and early decisions are starting to roll in. Before you know it, the New Year will be here and it’ll be time to finally choose a law school. I know, I know. It seems like just yesterday you were first cracking open that LSAT study guide, so young and naïve. Scared of what the future held; scared of what your score would be. And scared that you’d be rejected from every law school to which you applied. 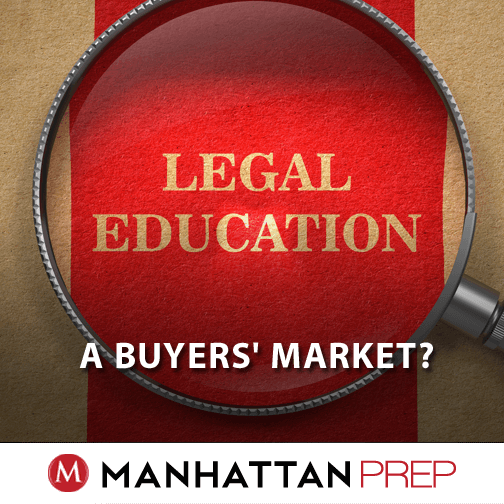 However, a recent NYT article points out exactly how misguided you might be—could law school really be a buyers’ market? Professor Rodriguez of Northwestern University School of Law says, “It’s insane,” and I agree. We do, however, disagree on what aspects of law school tuition are insane. According to the article, the number of people taking the LSAT is down over 50% from 2009, and the incoming class of first-year law students is the lowest it’s been since the ’70s. Law schools have reacted in a number of ways, including cutting employees, faculty, and even entire campuses (see Thomas M. Cooley Law School). And many now rely on their parent school to keep them afloat (a stark contrast to the previous decade where these schools were viewed as geese laying golden eggs). As Professor Rodriguez points out, law schools are now battling over top students. In order to keep their GPA/LSAT numbers up, schools are pulling from an increasingly small pool of candidates with high scores. To do so, they’re negotiating until almost the first day of classes, increasing scholarship amounts to match or beat competing schools. “It’s insane,” he claims, to need to fight with these other schools for students. I would rebut that it’s insane tuition at his school has increased $9,000/year during this same time period. So is law school a buyers’ market, or is that a bit of editorial license taken by the writer? Law school is a service, and the goal of that service is to get you a job as a lawyer. Because of the financial crisis, legal jobs are a lot scarcer (though they do still pay staggeringly large salaries). And despite fewer positions being available, the amount of work hasn’t decreased that much. This translates to even longer hours than pre-crisis (in other words, the jobs are even less pleasant). I’m glad to see the article use the “nine months after graduation” metric to measure employment, as other numbers tend to be gamed by law schools who hire their grads to inflate their stats. It’s still important to recognize, however, that 57% doesn’t represent people working at Big Law, or even the public sector. A large percentage also ends up at smaller firms, earning nowhere near the $180K/year salaries most young lawyers dream of. The amount of work, though, is about the same. So, in short, the “service” being provided by law schools is coming down in value. At the same time, their supply of new students is drastically dropping. And most numbers being reported suggest that the largest drop in applicants is coming from the top of the LSAT pool (see the decline in LSAT averages of even top schools). All in all, it is a good time to be. Emily Trieber is exactly right—treat the relationship as a business contract. When you first apply, the relationship is extremely asymmetric—you desperately want to be admitted, and they have all the power. However, after you’re admitted, the dynamic shifts. You’re their customer, and they’ve already told you they want your business. It’s hard to shift your view after spending so long hoping for any letter of admission, but it’s important to change your perspective so you graduate with as little debt as possible. And with a few other schools also interested in you as a customer, it’s time to negotiate. It’s always best to get in touch with the school via phone (or in person, if you can make a visit). Be honest with them about your offers from other schools, but use those offers to leverage better terms from preferred schools. And always be willing to ask—no one has ever had their offer rescinded for politely requesting a lower tuition bill. That’s really the key—treat the relationship as business one, which entails courtesy. The schools know that tuition is expensive and scholarship offers are on the rise. They also know that applicants are an increasingly rare commodity. Use this to your advantage and don’t accept sticker price as what you have to pay if you want to go to a particular law school. They’ve already told you they want you as a student; now, tell them that, in order to make that happen, they’re going to have to make you a better offer.